The Google Pixel XL, one of Google’s first flagships, has the first operating system Nougat, which can perform tasks such as split screen multitasking. Breaking away from contracts with companies such as HTC and Samsung for previous Nexus phones, Google has its own contender in the smartphone world, the Google Pixel. With its release on October 20, 2016, Pixel is Google’s first flagship that isn’t manufactured by other companies, but is it comparable to the highly-revered iPhone 7 Plus? 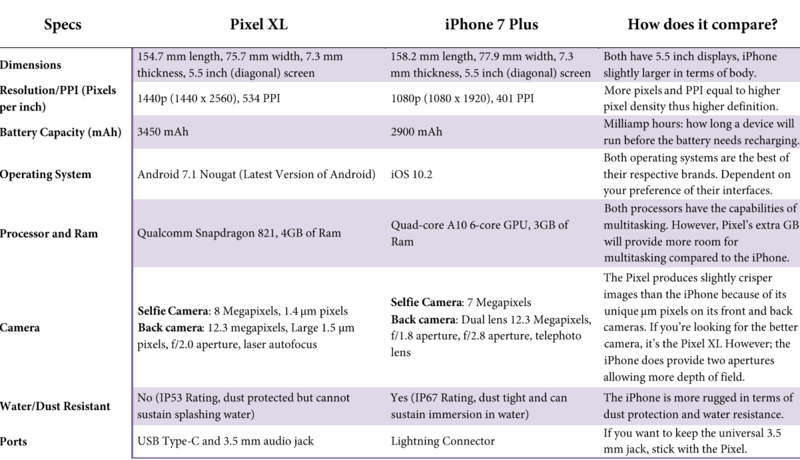 The iPhone 7 Plus and the Google Pixel have a lot in common. They each may do things a little differently, but from performance to pricing, these high rated smartphones may as well operate on the same page depending on preference. The iPhone 7 Plus features an LED-backlit display. On the Pixel XL it is an AMOLED display, which is usually a little more vibrant. The iPhone 7 Plus has 3D touch, which is sensitive to pressure so you can push down harder on applications to access more options. However, in terms of resolution, the Pixel XL definitely has the advantage with 2560 x 1440 resolution and about 534 PPI (pixels per inch) pixel density. The iPhone 7 Plus only has 1080 x 1920 resolution with a pixel density of 401 PPI, which isn’t bad in any way but nowhere near as good as the Pixel XL. The Pixel’s greatest asset is its smooth performance using Android’s newest operating system: Nougat. What’s impressive about Nougat is the balance between simplifying the Android UI (user interface) and retaining what people like about Android as a flexible and customizable platform. As the first smartphone to include the UI, Pixel unlocks a variety of new features. One of those is the Nougat split screen app mod: The ability to interact with two apps side-by-side feels much more useful. Meanwhile, Apple has decided to keep its own multi-app mode an iPad exclusive, which means multitasking on several apps is not a feature included in the iPhone 7 Plus. In short, Apple delivers a brighter screen than Google, making the iPhone 7 Plus a slightly more capable handset for outdoors usage; and it is water-resistant, a feature the Pixel phones lack, questions the durability of the Pixel. However, the Pixel might just be the easier phone to get the hang of. To add to that, it has some nice usability and multitasking with a simpler user interface. All in all, in comes down to preference. 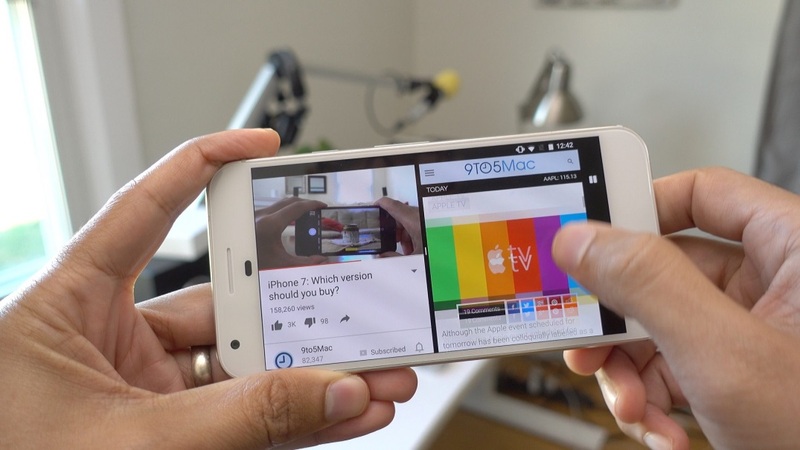 Both smartphones have a wide range of capabilities operating in similar ways. The Google Pixel is a worthy contender for one of Apple’s newest releases.